curd cup filling, yogurt cup filling, juice cup filling, water cup filling, lassi cup filling, cup filling sealing, plastic cup filling sealing, dairy cup filling sealing, ice cream cup filling sealing etc. Cup has to stack in cup hopper, the cups will pick up and go to filling station, each cup gets filled and then goes to next station where it will pick up the foil from stacked foil hopper, it will again go to next station for sealing, the sealed cup then emerge out. 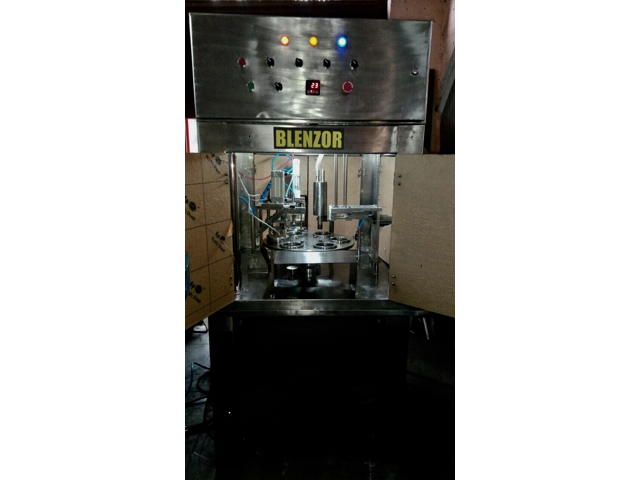 This machine is mechanical motor operated but compressed air is required for foil pick as well as sealing unit.